Back-Up Story: "The Origin of The Riddler"
As the Flash continues to interrogate the two Rogues about their involvement in Bart Allen's death, the explosive chips implanted in their necks by Deathstroke start to activate and cause intense pain. Deathstroke doesn't want them to reveal what he has planned for Green Arrow's wedding. Wally uses his vibration abilities to painfully extract the chips, then speeds to the nearest wharf and disposes of them before they detonate. Returning to the cemetery, giving them the benefit of the doubt since they didn't run, Wally arranges for Zatanna to transport all three to someplace safe. Back in the Palmerverse, Jason Todd is stopped by Atom from pursuing Belthera, who has Donna Troy in tow, because their numbers are depleted enough already. Jason objects, and just at that moment Green Lantern Kyle Rayner appears on the scene and offers help. With his power ring, he sends a�concussive blast to Belthera through the portal, then pulls Donna back through. "Bob", recovered from Belthera's spell, informs him that he is one of the Monitors' targets and offers him a chance to survive by staying with the group. Kyle accepts, obviously on account of Donna, much to Jason's jealousy. As for the whereabouts of Ray Palmer, Kyle says he's already been where they are but he's gone into the Multiverse. At Chung Ling Soo Square in China, Klarion The Witch Boy has entrapped Mary Marvel in a bubble for protection against a wizard in protection of the hidden realm. Outraged at this unprovoked attack, Mary explodes from the bubble and grabs the old man by the lapels ready to reap retribution when Klarion stops her. The old man runs off leaving Mary feeling guilty for going over the top once more. Klarion seeks a "thank you" from her for saving her life but she refuses on account of the fact she believes Klarion's trying to blackmail her. Klarion assures her all he wants is a tiny fraction of her power in return for his services. Two sedans are chasing the young photographer through the streets of Metropolis. Jimmy tries to access his powers but nothing happens. Finally cornering Olsen, the driver identifies himself as Mickey Cannon of Cadmus Labs and says he has some theories as to the cause of Jimmy's sudden empowerment. They were chasing him to see what he was capable of and promise they only want what he wants: answers. Elsewhere, Flash and the Rogues appear in guest quarters for Green Arrow's wedding. Flash assures them both they'll be safe BUT the chain stays on due to his trust issues and they don't leave or they'll regret it. Piper complies with Wally's wishes before he leaves, but Piper will hear none of it, fully aware of Zatanna's reputation of mindwiping Dr. Light and other villains. He knocks Piper out and is willing to drag him out by their chain. However, as soon as he opens the door a mummy is there to greet him. Back in the Palmerverse, Donna tries talking to Jason about his problem with Kyle but he won't open up. However, just as they're ready to go into the Multiverse, a massive hand abducts the Atom. Kyle wants to go after him, but Todd tells him to focus on Palmer because he's the only one who can help avert the coming disaster. Bob agrees, and Kyle finally concedes begrudgingly, noting the GL Corps are taught to leave no one behind. In a protective bubble via GL's power ring, the foursome disappear into the multiverse. Edward Ashton's decisions to cheat in a grade school puzzle contest and running a crooked carnival game were just some of the events that led to his life of crime. Changing his name to Edward Nygma, he soon called himself The Riddler, a costumed rogue obsessed with baffling Gotham's police force with deadly games and puzzles, yet always coming up short when encountering The Batman. Although he eventually deduced the greatest riddle of all, Batman's secret identity, which he shared with Hush, he suffered a head injury that resulted in partial amnesia. Recovered and reformed, Riddler is now a private investigator and consultant for the GCPD, but who knows whether this is a�legitimate change, or just another puzzle for Batman to solve. Main Story - 3: For some reason this issue didn't really hold me. It sounds like Dini's trying to embed the events of Countdown into current events such as the impending�nuptials of Green Arrow and Black Canary in the JLA books. By doing so they took away a great opportunity to see Flash go nuts on the men who not only betrayed his trust but were involved in Bart's death. He let them off too easily, if you ask me. He just seemed too together, too rational. However, Dini redeems himself by�having one of these two idiots actually be repentive, which only adds to the danger they face. Dini also�does the story justice by upping�the sexual tension between Donna and Jason, the most unlikely couple I've ever seen. I see the chemistry, but I think Paul got ahead of himself. Isn't Kyle Rayner supposed to be Parallax right now in affiliated Green Lantern books? The continuity's screwed up because there's no mention of what's happening outside the Palmerverse. And finally Jimmy. After the stuff that Cadmus was involved in during the Death of Superman storyline, wouldn't he know that this place can't be trusted? Wouldn't his new cosmic awareness let him know that Lex Luthor had a hand in the company's founding? Guess it was on an off day when being chased by Sedans. In a nutshell, though there were certain redeeming factors in the story, the overall plot just lacked severely this week, especially in the Mary Marvel story. Main Art - 3: It's hard to pinpoint Magno's style. There's a�hints of Walt Simonson and Bill Sienkiewicz in his pencilling. Some of the male characters seemed a little too pumped, especially the Flash, who's supposed to be a fleet runner. As an artist myself, I always have to have in the back of my mind the character's traits, so that when it comes time to put pencil to paper, I�incorporate that into the final image. I know Wally's an adult and not a Teen Titan, but he just looks too ripped. I don't have any complaints about the female characters though; Mary Marvel was dead on. As for Klerion, I liked the grey skin; it made him all the more creepier as a Goth-like kid rather than a reject from that god-awful Addams Family TV remake a couple of years back. Jimmy however I barely recognized, bereft of his trademark freckles and youthful appearance. In summary, this art is okay but not the best, which might not be the artist's fault but rather the breakdowns. Back-up Story - 4: An excellent condensed look back into Edward Nyma's (I'm sorry, Ashton's) past. See, the majority of my knowledge of The Riddler isn't from the comic, but BTAS, which Dini was a writer on. I'm not sure if I agree with the "bad from the start" motif Beatty established, but at least he referenced the events of BATMAN: HUSH. However, he neglected to mention the brain tumor and how "enlightenment" about Batman's secret came to him after taking a dip in the Lazarus Pit. I don't know; in this version of the Riddler's origin, the master of puzzles seemed less of a genius than the more-respectable man in green voiced by Lionel Luthor himself, John Glover. Back-up Art - 5: There's not much I can say about Kramer's work. His shot of the classic Riddler vs dynamic duo was referenced obviously from somewhere, but it was good that he laid the chronology out. From a visual standpoint I was NEVER a fan of the skintight green longjohns. At least in the suit and bowler hat he looks a little less goofy and more confident and arrogant. However, at some points that should be dark the layouts seem a little too cartoonish, such as the thought balloons above Hush and Nygma in the panel where he tells Hush who Batman really is. Other than that it's a good job. Cover Art - 5: A really dynamic shot. 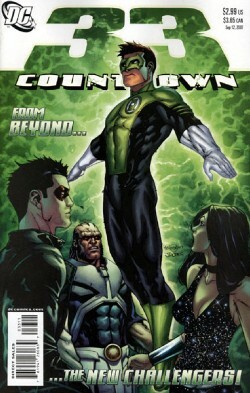 The central figure of Kyle Rayner just pops out at the viewer and for once has an integral connection to the story whereas other covers in this series have not. It signals a change in the roster looking for Ray Palmer that could make a significant difference. Props to Caldwell and Smith because they were on their game in this shot.